Think, suppose and assume are separated by a thin line of difference. Think and suppose can be often used as synonyms too, and in this grammar article we will see where these words can be interchangeably used and where one of the three is more appropriate than others. Happy reading! Thinking – of course, is a thought that buds from a brain or mind. What you ‘think’ may be or may not be true. It is based on your perception and intelligence. · I think you should start exercising from tomorrow. You seem fit now. · I think we must not trust them regarding financial matters. · I don’t think you are fit for this job. · I would like to think you like me! Suppose is based on one’s own thinking and assumptions. Supposing something can be based on imagination or facts. · I suppose you were working late yesterday. · Suppose, you are alone at the bus stop at night. What would you do? Suppose can also mean a work or prerequisite that one is required or expected to do. · You are supposed to work on the theory, aren’t you? · This process supposes that the water is already in boiled state. Assumption is believing something to be true based on certain facts but not all. For example, you may assume the nature of some person based on another person’s account of the said person. · As I saw you near the theatre, I assume you have already watched the movie. · To prove this theorem, we have to assume certain conditions to be true. · She assumed that I bad-mouthed her. Assume can also mean to take a responsibility. · He assumed full control of the organization in the absence of the president. As we can see, these words are interlinked yet are used for different purposes. Think essentially is to brain-storm or to have (an idea or thought) in mind. Suppose is just going ahead with something based on less or no data. I think – based on what you say, I am trying to ponder about your logic and I also feel that you are right. I suppose – though you have given me some facts, I am not convinced, yet you could be right since you have some facts and I don’t have any proof to state otherwise. Suppose you have 1 crore with you. What will you do with the money? Assume that you have 1 crore. What will you do with the money? Both the above sentences have the same meaning. Also, since both suppose and assume are used in different contexts as well (as we have seen in examples previously), the difference in meaning is obvious there. Think – a belief based on some idea. Assume – a belief without any proof, based on guess. · Why do you assume you know what I think about her? · How can you assume that I would think about leaving this job? · Don’t assume something to be right, just because you think so. I suppose it is safe to assume that the trains will resume services on Monday but we can still think of other modes of transport like flight or bus as another option. I hope this article clears the differences between these 3 words, and you can now use these words appropriately with ease. "Think vs. Suppose vs. Assume." Grammar.com. STANDS4 LLC, 2019. Web. 22 Apr. 2019. 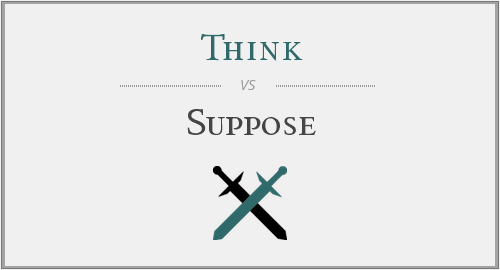 <https://www.grammar.com/think_vs._suppose_vs._assume>.